This week I’ve been working hard on a few things that aren’t ready to show. The first of which is a sketch cover comission, it is putting me through my paces and I’m being cautious (possibly too cautious) because I worry about making a mistake. Fear and art aren’t the best combination so I’ve also been trying to avoid the fear, but in reality it is just made me avoid working on the cover. Tune in next week for the progress on that. I’m also happy to start work on the first The Force Awakens licensed material. It is a sketch card set that will be coming out later this year, I plan on doing full oil painted cards. Earlier in the week I finished up these Harry Potter sketch cards. I did Hermione first, but it didn’t feel right unless she had the boys with her. Currently this 3-card set sits in my store, take a look if you are interested. 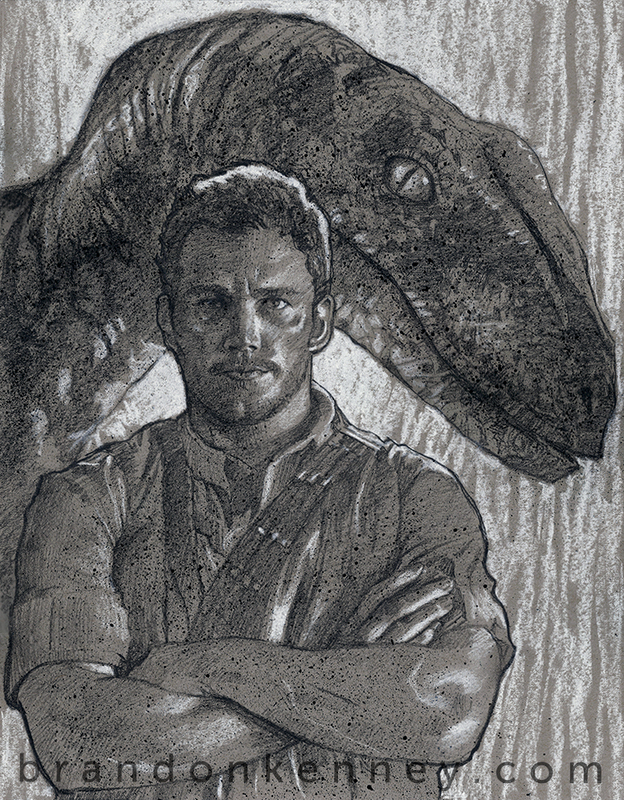 I also had a chance to work on a Jurassic World drawing. This was a lot of fun! I implemented some pastel into my toned sketches. Unfortunately I still have yet to see the movie. Everything I’ve heard is good and I know it broke a bunch of box office records. I am going to try my hardest to go see it this upcoming week! In between the oil painting and stuff for my store I like to just turn off my brain and sketch during the week, here are a few sketches I did this past week. These kind of things usually show up first on my Instagram page. On top of finishing the sketch cover (which is currently top priority) I will finishing up some other paintings this upcoming week. The Boba Fett and Han Solo 5x7s are very close to completion, and I also have a Padme that is about halfway done. Keep an eye out for a few Disney oil sketch cards as well! 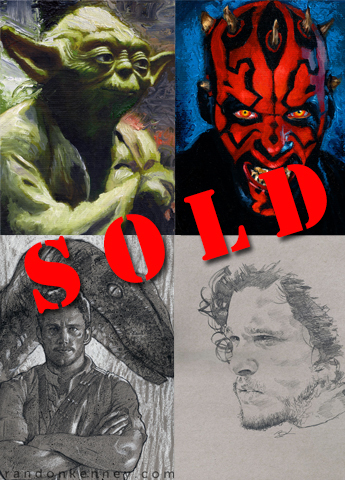 That’s it for now, I’ll see you next week, but before I leave here is some of the original artwork that I sold this week! Next Next post: New artwork for sale.